For his parents' 60th anniversary, writer and chef Kevin Weeks cooked up a meal for 20 adults and five children. Robert and Jane Weeks (center left and right) were the guests of honor. Get recipes from Weeks' anniversary celebration menu: Arrosto di Maiale Al Latte (Milk-Braised Pork), Beet Salad with Chevre, Leeks with Anchovy Butter and Rhubarb Mousse. Planning, planning and more planning is the key to cooking for large groups. 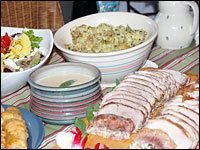 NPR.org, May 21, 2008 · This is the season when home cooks become caterers, the time of year when the online cooking consulting company I work with is inundated with requests for help from people planning events. A typical question: "I'm cooking two, 5-pound pork roasts. Can I cook them at the same time?" or, the rather vague: "I'm planning a graduation party for 75. How much food do I need?" It's hard to know how to even begin answering such questions. It's as if someone decided to personally fly a plane from New York to San Francisco and their first question is: "Do I need to get a plane at the airport?" Nevertheless, catering a large event yourself isn't impossible. But it does require careful, even obsessive, planning. My cutoff point is 25 guests unless I have access to a professional kitchen and have professional help. And even then I'll only do it with the right menu. Last weekend my parents celebrated their 60th wedding anniversary. 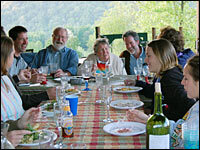 We picked a date when we could gather a large number of family members at my sister's farm in Virginia. It coincided with my brother's marriage so the celebration was doubled, and I was "volunteered" to prepare the feast. There would be 20 adults and five children. Aside from the kids, I knew the guests would be open to anything: no vegans, no celiac disease, no allergies. I knew three of the children were picky eaters and initially declined to cook for them. Then I realized I'd have three sets of parents competing with me for cooking space at 6 p.m. So I took responsibility for feeding the kids as well. For an event like this you need to own the kitchen space, and given that I'd never seen the kitchen I'd be working in, that was even more important. I began menu planning by choosing a main dish, then built the meal around it. I started with arrosto di maiale al latte, milk-braised pork, for several reasons: It's absolutely delicious; it's unusual; I have a roasting pan large enough to cook enough for the entire party in a single oven; and it cooks for two and a half hours but can go as long as three hours, so serving time is flexible. Best of all, once in the oven, I can almost forget about it, leaving me free for other tasks. I spent a couple of weeks thinking about side dishes and ended up with roasted beet and feta salad, leeks with anchovy butter and rhubarb mousse. I could roast the beets, parboil the leeks and make the mousse a day in advance. The salad is quickly assembled just before serving, and I added the leeks to the menu when I discovered I had two ovens available. With only one oven, I wouldn't have done both the leeks and the pork. They can't go in one oven together because the pork cooks at a low temperature while the leeks require a high temp. With two ovens, however, I got to use another seasonal vegetable. I prefer to use seasonal produce, but when preparing for an event such as this I don't let that preference dictate. It's far more important that the dishes be doable within the less flexible constraints of time and equipment. However, that doesn't mean I'd serve a dish that relied on an out-of-season item. A tomato salad, even in May, is a bad idea. • Choose dishes that you can completely make a day or more in advance — and consider refrigerator/freezer space in the equation. • Choose dishes that can be at least partially prepped a day or more in advance. • Choose dishes that can be completely cooked or prepped prior to the party. For example, prepping a green salad a day in advance will produce a wilted salad, but it can be prepped two or three hours in advance of serving and then dressed at the last minute. • Think about the pots and pans required and the need for stovetop or oven space. Make a list of equipment required for each dish. • Repeat previous steps until you have no conflicts between pots and pans, refrigerator/freezer space, burners and oven. And, do you have enough kitchen timers to track everything? • At this point you will almost certainly have found new conflicts and need to go back through the menu yet again. • If you have helpers, assign them tasks at this point. And think about kitchen space in general. Decide where prep will occur and who does it. Who will man the stovetop? Who will man the oven? It might be the stovetop person, but it might not. And think about how much "people space" the kitchen has — you may not have room for Aunt Maude to make her famous peach surprise. And on the subject of helpers. I once cooked a meal for 15 of my cooking buddies. I had access to a large, well-equipped kitchen; I had two fellow cooks who had volunteered to help; I had a detailed schedule that allowed for distractions (I built an extra 30 minutes into the last two hours of the schedule); and yet still served the meal half an hour late. Why? Because my helpers didn't help much. They both wandered off to join the party and left me to do the work I'd assigned them. Keep this possibility in mind. You cannot overplan cooking for a large party. Start early, make lots of notes, iterate and reiterate, and divide the last two to three hours of your schedule — and the tasks that remain — into 10-minute intervals. This fine detail will help you avoid getting overloaded. And by the way, the anniversary party was a complete success. 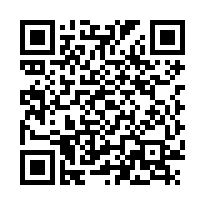 NPR.org, May 20, 2008 · This recipe started appearing on food blogs back in 2006. I suspect its popularity stems from the fact that it's so surprisingly delicious. I've modified the original by adding fresh, chopped sage to the braising liquid and thickening it with beurre manie, or "kneaded butter," a mixture of butter and flour. The dish appears simple, yet it's extraordinarily rich, deep, bold and complex. Best of all, it's a great choice for a large group because you can pretty much put it in the oven and forget about it. Allow roasts to warm on the counter for 2 hours. Thoroughly blend butter and flour (beurre manie) in a small food processor or using a hand mixer; set aside. Heat olive oil in a large, heavy roasting pan over medium-high heat. Generously season pork with salt and pepper, then brown on all sides in the roasting pan. Pour out the fat in the bottom of the pan. Add milk and garlic (the milk should come halfway up the sides of the roast), cover pan tightly with a lid or aluminum foil and place in the middle of the oven. Cook for 1 hour. Turn roast over, replace cover and cook another hour. Turn roast over again and cook 30 minutes more, still covered. 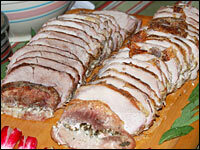 Remove from oven and set roast on a cutting board, covered with foil, and allow to rest 10 to 15 minutes. Pour milk sauce into a blender, scraping out all the milk solids, and blend until smooth. Pour milk sauce into a sauce pan and bring to a simmer over medium heat. Stir in butter and flour mixture and continue to simmer, stirring constantly, until thickened, about 4 minutes. In advance: Prepare and start cooking roasts 3 1/2 hours before planned serving time. If you need to delay serving, turn off the oven after cooking for 2 1/2 hours and leave the roasts in for up to 30 minutes before pulling from oven, resting, and serving. NPR.org, May 20, 2008 · Brightly flavored, colorful and dead easy, this can be prepped in advance and then assembled 10 minutes before serving. The sweet beets are great with a tangy chevre (goat cheese) and the sherry vinaigrette complements both the beets and cheese. I used a mesclun mix and added pea sprouts for an earthy note, but mesclun alone would be fine. Trim greens from beets, but do not peel or cut into beet itself to prevent bleeding. Put whole beets in a large pot and bring to a boil in water. Reduce heat to a simmer and cook until tender, 30 to 40 minutes. Transfer beets to an ice bath to stop cooking. In a small bowl, whisk together olive oil, vinegar, garlic, salt and pepper to taste, and add 1/2 cup mint. Place onions in a bowl, coat with some of the vinaigrette and allow to sit for 15 minutes. Cut beets into bite-sized pieces (they'll bleed, so cut them over the sink). 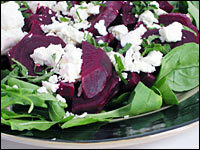 Arrange greens on a platter, add beets, sprinkle with goat cheese and remaining mint and dress with vinaigrette. In advance: Cook, peel and slice beets a day in advance. Seal in a plastic container and refrigerate. You can also make the vinaigrette a day in advance. The mint in the dressing will wilt, but the flavor will be even more pronounced. NPR.org, May 20, 2008 · I discovered the wonders of anchovies some 20 years ago when something prompted me to add a tablespoon of anchovy paste to a spaghetti sauce. The results were amazing! The anchovy flavor that I, like so many Americans, disliked disappeared, but the sauce became much richer and deeper in flavor. I've been experimenting with them ever since and becoming more bold in their use. In this recipe you get a faint taste of the fish, but it's a background flavor while the leeks really sing. You can use either oil- or salt-packed anchovies. Heat oven to 450 degrees. Bring a large pot of salted water to a boil. 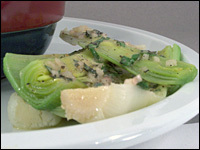 In a small bowl, combine all ingredients except leeks and mix thoroughly. Tie the leeks into 5 bunches using cooking twine (to keep them from falling apart), add the leeks to the boiling water and cook until tender, about 7 minutes. Immerse in ice water to stop the cooking. Drain. Place leeks cut-side down between paper towels and gently press out excess water. Place cut-side up in a large baking dish. Spread the butter mixture over the cut sides of the leeks and bake for 5 minutes, or until warmed through. In advance: Cook the leeks the morning of the event and then assemble dish, cover with plastic wrap and refrigerate until ready to roast. Make the butter up to a couple of days in advance. NPR.org, May 20, 2008 · Several years ago, I was trying to come up with something to do with rhubarb besides the usual cobblers and pies. I love the vegetable's lucious tartness, and I saw no reason to dilute its natural flavor with its usual partner, strawberries. So I came up with this recipe, which has been a major hit ever since. Peel limes, being careful not to include pith. Cut the rind into strips, wrap in plastic and refrigerate. Squeeze juice from limes. You need about 3 tablespoons of lime juice. Place rhubarb in a large sauce pan with water and 3/4 cup sugar over medium heat. Cook, stirring often, until rhubarb breaks down. You will have a thick, fibrous sauce — and no recognizable chunks of rhubarb. Transfer to a food processor, add gelatin and lime juice, and process until smooth. Allow to cool. In a double boiler, beat the egg yolks with remaining 1 1/2 cups sugar until a pale yellow. Cook over just-bubbling water, stirring constantly, until yolks have thickened. Cool to room temperature. Combine rhubarb mixture with egg mixture. 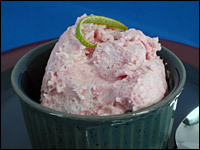 In a large bowl, whip cream until stiff and fold into rhubarb mixture. Spoon into individual dessert cups or wine goblets and chill for at least 3 hours. When ready to serve, garnish with strips of lime peel. In advance: This dessert is perfect for making entirely a day in advance and then chilling until ready to serve.